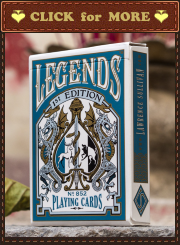 Founded in 1992, family owned Heritage Playing Card Company (UK) has created a beautiful range of illustrated playing cards to entertain and educate. Each their deck has its own thought-out theme. They found a nice compromise between visual and textual information on playing cards to make them suitable for games, educational purposes and playing card collecting. Their playing cards are sold in more than 20 countries around the world. Many of the decks were printed in three languages (English, French and German). The Famous Wild Cats Playing Cards [Chats Sauvages (French), Großkatzen (German)] is the deck of playing cards dedicated to different wild cat species living in our world. 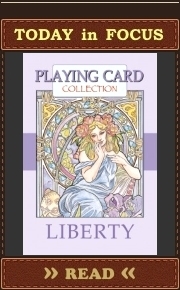 Heritage Playing Card Company produced these playing cards under licence from Trioview Ltd. The deck: 52 different playing cards with images of wild cats + 2 different Jokers + 1 information card. Indices and pips are in all four corners. Bridge size. Playing cards were printed in Belgium, supposedly by Cartamundi. They use casino cardboard and have a smooth finish. In reality there are only 36-37 species of wild cat (30 of them are small wild cats). So there were used some tricks to make the deck of 54 wild cat playing cards. Some wild cats are repeated on several playing cards. Cubs of wild cats also used for this deck as well as some subspecies of wild cat species. So take your home mewing pets on your knees and let’s start our journey into the world of wild cats (English version of this deck). One interesting fact: Tigers are excellent swimmers and do not avoid water. Its possible child is on the Ten of Spades. Its relatives are on the Five of Hearts, the Jack of Diamonds and the King of Diamonds. One interesting fact: These cats are the only forest-dependent wild cats in Africa, yet remain almost entirely unstudied. One interesting fact: Unlike other cats, lions have a tuft of hair at the end of their tails. Its relatives are on the Ace of Hearts, the Jack of Hearts, the Queen of Hearts and the King of Hearts. One interesting fact: The Bay Cat is found only on the island of Borneo. It is the mystery member of the wild cat family because scientists found it and started to study it only in 1990s. One interesting fact: Margays are the wizards of the tree tops. Their broad, soft feet and mobile toes allow them to hang from tree limbs by one hind foot, and flexible ankles can rotate the foot 180 degrees outward. They are exceedingly quick, and even during a fall they can grab hold of a branch with one front or hind paw and climb up again. One interesting fact: The ancestor of the African wildcat and the domestic cat is estimated to have diverged about 131,000 years ago. Several interesting facts: Snow leopards have unusually large nasal cavities, allowing them to breathe the thin cold air in their mountainous environments. They have very large paws, which act like snowshoes to help them walk on top of the deep snow. These animals will often use their tails, which are 90 percent of their body length, to cover their faces for added warmth during the very cold temperatures. The snow leopard’s coat is the thickest of any cat. Its relations are on the Ace of Hearts, Two of Hearts and the Five of Diamonds. One interesting fact: Asiatic Golden Cats have long been known in Myanmar and Thailand as “fire cats”. Legend says that carrying one hair will give the bearer protection from tigers, or burning the pelt will drive tigers away from the village. One interesting fact: Cheetahs do not roar. Instead, they purr. See parents of this cub on the Five of Clubs and the Queen of Clubs. One interesting fact: There are 8 sub-species of tigers recognized today and no two animals have the same pattern (stripes). See parents of this cub on the Ace of Spades or the King of Diamonds. Its relatives are on the Five of Hearts and the Jack of Diamonds. One interesting fact: Like other Lynx, Bobcats are skilled hunters that make use of great hearing (the tufts on their ears are a hearing aid) and eyesight so strong that a lynx can spot a mouse 250 feet (75 meters) away. Its relatives are on the Queen of Spades, the Two of Diamonds and the Four of Diamonds. One interesting fact: European Lynx are the largest cats of its species (Lynx). 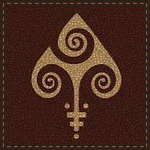 Its relatives are on the Jack of Spades, the Two of Diamonds and the Four of Diamonds. One interesting fact: The word caracal means “black ears” in Turkish. Large, tapering ears with 2 in (5 cm) erect tufts of black hair, used for communication, are the most unique feature of this cat.